Wallace Wade led the Crimson Tide to their first National Championship with a 10-0 record, and one of the most dominant defenses in the era. Alabama shutout eight of their 10 opponents and gave up just 26 points the whole season, giving up seven points to Birmingham-Southern and 19 to Washington in the Rose Bowl. The Crimson Tide gave up an average of 2.6 points per game. The offense also had a solid season running the sigle-wing scheme, scoring 29.7 points per game. Quarterback/fullback Pooley Hubert and halfback Johnny Mack Brown were both inducted into the College Football Hall of Fame. You can say that the 2010 team is one of the most talented teams in the Crimson Tide’s storied history and maybe even college football history, with future NFL players such as Mark Ingram, Julio Jones, Chance Warmack, Marcell Dareus, Dont’a Hightower, Courtney Upshaw, Dre Kirkpatrick and Mark Barron. The team was also coming off the school’s first National Title since 1992, but they seemed to just be missing the “it” factor that most Saban teams have had. Alabama got off to a 5-0 start, but were upset by #19 South Carolina, 35-21, in early October. The team would rebound to win their next two games, but would lose a heartbreaker to the LSU Tigers in their next game. They would also lose to arch rival Auburn, 28-27 at home, after leading 21-0 after the first quarter and 24-7 at halftime. The Crimson Tide went on to play #7 Michigan State in the Capital One Bowl, beating the Spartans 49-7, proving all their critics wrong and showing the nation just how good the team really was. The Tide’s defense finished the season ranked third in scoring defense (13.54 PPG), fifth in total defense (286.38 YPG), 10th in rushing defense (110.15 YPG) and 13th in passing defense (176.23 YPG). They also led the SEC in scoring and total defense. On offense, Alabama ranked 18th in scoring offense (35.69 PPG), 22nd in total offense (444.08 YPG), 27th in passing offense (261.15 YPG) and 29th in rushing offense (182.92 YPG). The 1994 team was a win away from potentially playing Nebraska for the National Title, but the team came up just short against Florida in the SEC Championship Game, 24-23. The Tide had a 23-17 lead after Dwayne Rudd took an interception back for a touchdown. The Gators would score with 5:29 left in the game after Alabama dropped a couple of interception opportunities, giving Florida the victory. The Crimson Tide would beat Ohio State in the Citrus Bowl 24-17, finishing the season 12-1. Alabama quarterback Jay Barker had a big season for the Tide, while playing with a hurt shoulder, winning the Johnny Unitas Award, which is given to the best quarterback in the country. He also had one of the best games of his career against Georgia, leading the Tide to a 29-28 victory over the Bulldogs in comeback fashion. That game is still one of the best to ever be played in Tuscaloosa. The 2014 team, like so many other Alabama teams, was so close to winning the National Title yet again. The Crimson Tide started the season ranked as the number two team in the country and got off to a quick 4-0 start before playing at Ole Miss. The Rebels would pull off the biggest upset in their school’s history, beating the Tide 23-17 and giving Alabama their first loss of the season. The Crimson Tide would win their next eight games and cruise into the first ever College Football Playoff as the number one team in the country, after beating Missouri 42-13 in the SEC Championship Game. Alabama would take on Ohio State and most thought the Tide would roll all over the Buckeyes, especially with their third string quarterback (Cardale Jones) getting the start. The Crimson Tide would go up 21-6 with 8:07 remaining before halftime, when the Buckeyes woke up, scoring 28 straight points to go up 34-21. Alabama would fight back but would never take the lead again, losing the game, 42-35. The Crimson Tide ranked fourth in rushing defense (102.43 YPG), sixth in scoring defense (18.4 PPG), 12th in total defense (328.4 YPG) and ranked 59th in passing defense (226.0 YPG). On offense, they ranked 16th in scoring offense (36.9 PPG), 18th in total offense (484.5 YPG), 29th in passing offense (277.9 YPG) and 37th in rushing offense (206.64 YPG). When you think of the 1977 team, you think of the amazing Ozzie Newome receiving passes from Jeff Rutledge and the dynamic rushing attack of Johnny Davis and Tony Nathan. You might also think about the team that was upset by unranked Nebraska to start the season 1-1 and recovered to win 10 straigh games, including an unbelievable win at #1 USC, 21-20. The Crimson Tide would finish the season ranked as the #2 team in the country, after blowing #9 Ohio State out, 35-6 in the Sugar Bowl. Alabama wouldn’t win the National Title in 1977, but this season was the stepping stone toward the success the team would experience over the next few years. The 1965 team was Paul “Bear” Bryant’s third National Championship team with the Crimson Tide. They weren’t as dominant as other championship teams, losing to Georgia to start the season and tying Tennessee on the Third Saturday in October, but the team still found a way to get the job done after close calls against Ole Miss and Mississippi State. Alabama went into their Orange Bowl matchup with Nebraska as the No. 4 team in the country and being crowned the National Champion looked like an improbable task for the Tide. It took No. 1 Michigan State falling to No. 5 UCLA and No. 2 Arkansas losing to unranked LSU for the Tide to have an opportunity. The Crimson Tide would go onto hand Nebraska their only loss of the year, beating them 39-28. Like so many other great Alabama teams, the 1971 team was just one win away from a National Title. This team had Alabama greats, John Hannah, Johnny Musso, Tom Surlas, Robin Parkhouse and Jeff Rouzie. Alabama upset No. 5 USC 17-10 to kickoff the season and would end up winning their next four games by a combined score of 162-12. It was the first year running the wishbone offense for the Tide and would help them go 11-0 in the regular season, but they would end up getting blown out by No. 1 Nebraska in the Orange Bowl, 38-6. Joe Namath struggled with knee injuries all season, after going down against NC State without being hit. Backup Steve Sloan would take over for Namath (he played while injured in a few games) and helped lead the team to a 10-0 regular season, before also going down with a knee injury in the final game of the regular season against Auburn. Alabama was just one game from going undefeated with an Orange Bowl matchup against Texas looming. Namath was set to start, but suffered a knee injury again in practice, just four days before the game. Sloan got the start, but the Crimson Tide fell behind 14-0. Namath came into the game, with a bad knee, and got the Tide within inches of winning the game, coming up just short on a QB sneak. To this day, Namath says he scored on the final play. Alabama would lose by a score of 21-17, finishing the season 10-1. Alabama came into the 1934 season after going 7-1-1 and winning their first Southeastern Conference championship in 1933. The Crimson Tide had plenty of talent with players like quarterback Riley Smith, end Don Hutson, end Paul W. “Bear” Bryant, fullback Joe Demyanovich and halfback Dixie Howell. They also had one of the best young coaches in the nation in Frank Thomas, who had a 24-4-1 record at Alabama entering the season. Alabama pretty much ran through their regular season schedule, blowing out Howard, Sweanee and Mississippi State to open up the season. Then they hosted Tennessee, who would give them their toughest battle of the year, but the Crimson Tide would remain unbeaten with a 13-6 victory. Alabama would go on to outscore their next five opponents (Georgia, Kentucky, Clemson, Georgia Tech and Vanderbilt) by a combined score of 174-20. They then headed to the Rose Bowl to take on the Stanford Indians, who entered the game with a 9-0-1 record. Alabama would trail 7-0 early, but would score 22 points in the second quarter and another seven in the fourth quarter to give them a 29-13 win. It took the win over the Indians for the 10-0 Crimson Tide to be named the National Champion by some publications, with Minnesota also getting crowned as the Champion. Alabama averaged 31.4 points per game, while allowing a measly 4.5 points per game. They finished with five shutouts and the most points they allowed in a single game was just 14 to Kentucky. The Crimson Tide was so close to a perfect season, but an agonizing 24-23 loss to Notre Dame in the Sugar Bowl ruined Alabama’s dreams of perfection. The team still got the No. 1 vote in the Coaches Poll, securing a National Title, but this team was so close to being undefeated and getting the consensus vote. The Tide showcased one of the best offenses in the program’s history, averaging close to 40 points per game. Their offense featured a two quarterback system with Gary Rutledge and Richard Todd both receiving snaps. They also had a dominant rushing attack behind Wilbur Jackson and Randy Billingsley. The Crimson Tide flew through the regular season, going 11-0, blowing out rivals Tennessee (42-12), LSU (21-7) and Auburn (35-0) during that span. Alabama was named regular season National Champions by the coaches poll and would have the opportunity to play Notre Dame in the Sugar Bowl for the AP Championship. Alabama scored a touchdown late to make it 23-17, pending the extra point, but kicker Bill Davis missed the PAT and Notre Dame went back down the field to score, giving them the AP National Championship. The 1973 team looked a lot like the 2016 team, dominated all of their regular season games and lost in the final moments of the most important game of the season. The 2016 team was just a few minutes away from winning the National Championship when Deshaun Watson drove Clemson down the field, scoring a touchdown with just seconds remaining, giving the Tigers the 35-31 victory. This Crimson Tide team would have probably been called the greatest in school history (if not the greatest team ever) had they pulled off the win. Alabama was lead by freshman quarterback Jalen Hurts and one of the best defenses to ever take the field. The Crimson Tide finished the season ranked first in scoring defense (13.0 PPG), tied for first in total defense (261.8 YPG), first in rushing defense (63.9 YPG) and 24th in passing defense (197.9 YPG). On offense, they ranked 12th in rushing offense (245.0 YPG), 16th in scoring offense (38.8 PPG), 34th in total offense (455.3 YPG) and 87th in passing offense (210.3 YPG). The 2018 team was destined to be one of the greatest in Alabama’s rich program history, but that prestigious title came to an abrupt end when the Crimson Tide team was blown out by Clemson in the National Title game, 44-16. The team was led by sophomore quarterback Tua Tagovalioa and featured plenty of talent on the offensive side of the ball, the inexperience on the defense would show to be a major defect down the stretch of the season. This team would most likely be number one on this last if they had beaten Clemson. The 1978 team had a tough road to a National Championship, playing five top-11 teams, beating four of them and only losing to No.7 USC early in the season. The Crimson Tide would finish the regular season with an 10-1 record and an opportunity to play Penn State in the Sugar Bowl for the AP National Championship. The Nittany Lions entered the game with of the best defenses in the country and one of the best the program has ever had under Joe Paterno, while Alabama had the high-powered offense. The game was a locked in a 0-0 tie after the first quarter with both offenses struggling to move the ball. The score remained the same until the end of the second quarter, when Alabama finally broke the tie scoring a touchdown to make it, 7-0. The game was 14-7 going into the fourth quarter and Penn State was finally finding some momentum, driving down the field late in the game and a fourth and goal on the one-foot line. A touchdown would tie the game and put all the pressure on the Tide. Penn State ran the ball and Alabama’s defense swarmed to the running back, preventing a touchdown and securing the National Championship. Nick Saban led the Crimson Tide to their third National Championship in four years, with a commanding win over Notre Dame, 42-14. Alabama finished the season 13-1, with their only loss coming at home against Texas A&M, with future Heisman winner Johnny Manziel leading the way for the Aggies. Alabama was led by the best quarterback in program history in A.J. McCarron and a stacked offensive line with future NFL players Barrett Jones, Chance Warmack, Cyrus Kouandjio, Anthony Steen and DJ Fluker. The Tide also had a dominating defense, but it didn’t feature the big names like it did in other years. They allowed more than 17 points just twice, with the Aggies and Georgia in the SEC Championship scoring 29 and 28 respectively. The Crimson Tide ranked first in total defense (250.00 YPG), scoring defense (10.93 PPG) and rushing defense (76.36 YPG) and ranked seventh in passing defense (173.64 YPG). On offense, they ranked 12th in scoring offense (38.71 PPG), 16th in rushing offense (227.50 YPG), 31st in total offense (445.50 YPG) and 75th in passing offense (218.00 YPG). The 1966 team was coach Bryant’s second undefeated team and was one of his most dominant defenses, which was led by All-Americans Richard Cole and Bobby Johns. Alabama outscored their opponents 301-44 on the season and pitched a shutout six times on the season, only allowing seven points in their final five games. The team was snubbed by the polls, after Michigan State and Notre Dame split the National Title, after tying 10-10. The Crimson Tide would end up beating No. 6 Nebraska, 34-7 in the Sugar Bowl. Bryant led the Crimson Tide to their first National Title under his leadership in 1961, outscoring opponents 297-25. The team had a dominating defense that never allowed more than seven points in a single-game and shutout six of their opponents. They gave up just three touchdowns on the season, and gave up just six points overall in their final seven games. The Crimson Tide was led by quarterback Pat Trammell, guard Billy Neighbors and linebacker Lee Roy Jordan. Alabama’s chance at another SEC Title and undefeated season came to an end when they fell 26-14 at Auburn, but the Crimson Tide still made the College Football Playoff thanks to a Georgia win in the SEC Championship Game. The Crimson Tide would go on to beat the Bulldogs in the National Title game with a great second half comeback led by then backup quarterback Tua Tagovalioa who took over for Jalen Hurts, who didn’t look like himself in the first half of the game. This team looked dominant the whole season, but struggled a little down the stretch of the season due possible to injuries on the defensive side of the ball. The Crimson Tide won it’s fourth title under Saban in 2015, with one of the best defenses and the country and a high-powered offense led by running back and Heisman winner Derrick Henry. Alabama’s front seven might be the greatest to ever take the field with names like A’Shawn Robinson, Jonathan Allen, Daron Payne, Darren Lake, Jarran Reed, Dalvin Tomlinson, Reuben Foster, Reggie Ragland, Tim Williams and Ryan Anderson dominating opposing offenses. The Crimson Tide finished the season ranked first in rushing defense (75.73 YPG) tied for second in scoring defense (15.1 PPG), third in total defense (276.3 YPG), and 30th in passing defense (200.6 YPG). They also led the SEC in total, scoring and rushing defense. On offense, they ranked 30th in scoring offense (35.1 PPG), 32nd in rushing offense (199.93 YPG), 45th in total offense (427.1 YPG) and 62nd in passing offense (227.1 YPG). It took Gene Stallings just three seasons before he could bring a championship back to Tuscaloosa. The Crimson Tide were led by their defense once again, holding 10 of their 13 opponents to 11 points or less, shutting out three of those. The Alabama defense featured star defensive backs Antonio Langham and George Teague, both would have key plays in the SEC Championship and the Sugar Bowl. Langham had a pick-six against Florida, propelling them over the Gators and giving them the opportunity to face No. 1 Miami. Teague ran down a Miami receiver, who looked to have an easy touchdown, and stripped the ball of his hands. The play was overturned by an offsides on Alabama, but the play did prevent a Miami touchdown. The defense also featured All-American defensive linemen John Copeland and Eric Curry, while the offense was led by Jay Barker and one of the most skilled receivers in Crimson Tide history in David Palmer. It was Bear Bryant’s last National Championship team and probably his best. The Crimson Tide came into the 1979 season looking to repeat the success they had in 1978. This team had a lot to replace like QB Jeff Rutledge, LB Barry Krauss, DT, Marty Lyons, LB Rich Wingo and RB Tony Nathan. The 1979 team featured another great defense that gave no more than 18 points (Auburn) in a single game and only had an offense score double-digits on them twice (with Tennessee’s 17 points being the other). The Crimson Tide’s offense was also dominant, outscoring their first five opponents 219-9 and they outscored all of their opponents by a score of 383-67. The 2011 team had the most dominant defense in modern Alabama history. They ranked first in the country in four major categories, gave up more than 14 points just once (21 to Georgia Southern) and had four players picked in the first two rounds in the 2012 NFL Draft. The Crimson Tide cruised through their first eight games and into a matchup against No. 1 LSU in Tuscaloosa. 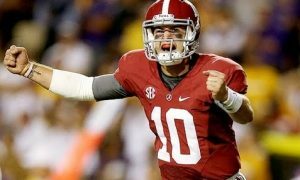 The game was being called the “Game of the Century.” Alabama ended up losing 9-6, after kickers Jeremy Shelley and Cade Foster combined to make just 2 out of their 6 field goal attempts, while LSU kicker Drew Alleman made all three of his. Alabama only dropped to fourth in the polls and were in striking distance of a rematch with the Tigers. Oklahoma State was ranked second in the country, but fell behind the Tide after losing to Iowa State in double-overtime. Stanford also had an opportunity, but got clobbered by Oregon the week before. Alabama became the number two team in the country yet again. Alabama got their revenge in the rematch beating the Tigers 21-0 and allowing them to cross the 50-yard line just once and gave up just five first downs the whole game. The Crimson Tide finished the season ranked first in rushing defense (72.15 YPG), scoring defense (8.2 PPG), total defense (183.6 YPG) and passing defense (111.5 YPG). 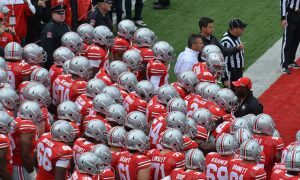 On offense, they ranked 16th in rushing offense (214.46 YPG), 20th in scoring offense (34.8 PPG), 31st in total offense (429.6 YPG) and 69th in passing offense (215.2 YPG). 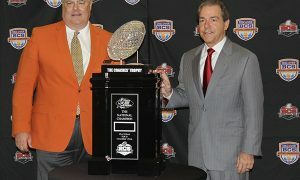 The 2009 team will always be remembered as the start of a dynasty and Nick Saban’s first championship team at Alabama. They’re also the only team to go undefeated under Saban. The Tide had plenty of momentum coming into the 2009 season, after the 2008 team went 12-2 and had most of their starters returning. The Tide were led by Rolando McClain, Mark Barron, Terrance Cody, Javier Arenas, Marcell Dareus, Kareem Jackson, Dont’a Hightower and Courtney Upshaw on defense and Julio Jones, Mark Ingram and Greg McElroy on offense. The Crimson Tide finished the season ranked second in scoring defense (11.71 PPG), second in total defense (244.14 YPG), second in rushing defense (78.14 YPG) and tenth in passing defense (166.00 YPG). They also led the SEC in total, scoring and rushing defense. The defense gave up 24 points in their opening game against #7 Virginia Tech and that would be the most they would allow all season. On offense, they ranked 12th in rushing offense (215.07 YPG), 22nd in scoring offense (32.07 PPG), 42nd in total offense (403.00 YPG) and 92nd in passing offense (187.93 YPG). Seven Alabama players were drafted in the 2010 NFL Draft, with McClain (8th to the Raiders) and Jackson (20th to the Texans) being drafted in the first round. The team also had a total of 13 players that would be drafted in the first or second round, with 10 of those going in the first.